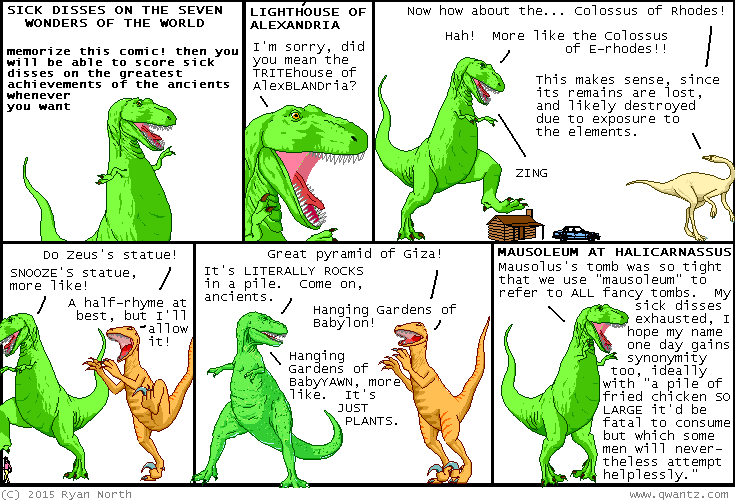 Dinosaur Comics - December 23rd, 2015 - awesome fun times! December 23rd, 2015: I did a comic about the Temple of Artemis back in 2008, and if you read the alt text (THERE ARE SECRETS TO READ IF YOU HOVER YOUR MOUSE OVER THE COMIC :0 ) you can read about one of the greatest coincidences in my life. One year ago today: Ever wish Newton had a calculator? Give him one and see what pops out!